A box for everything and everything in a box, is the best protection of your goods. Use uniform sizes of boxes and stack them shoulder high to maximize your total storage space. Begin packing a couple of days before you move. Careful packing pays by preventing breakage and loss of small and fragile items. And moving time is a great time to weed out old, unwanted or unneeded possessions. They only take up storage space. You'll want plenty of sturdy corrugated cartons, packing paper, sealing tape, and a magic marker-type pen. Then if you follow these simple packing tips, they will save you trouble, help avoid damage to your goods and make maximum use of the space in your storage unit. Appliances: Tape all appliance doors shut when moving. Wedge doors open in storage. Secure all moveable parts with paper or wedge. Wrap a paper pad around each item for protection. Freezer, refrigerator, washer and dryer make excellent packing cartons for bedding, towels and clothing. Always clean your stove before moving and give utility companies a few days' notice to disconnect appliances. Clothing: Clothing that ordinarily hangs in a closet should be packed in a wardrobe carton. Great Place! All New Facility! 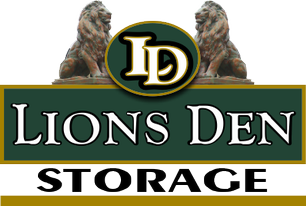 ©Copyright 2010 Lions Den Storage. All rights reserved.